While we were in Tanjung Puting area, I spotted many exotic animals. Unfortunately I cannot take their pictures because the moments were brief. I saw a kingfisher once. I was so lucky! It was one of the rare birds, with blue wings and golden body and red beak. 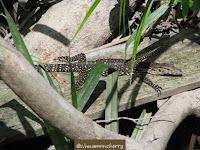 I also saw a sea hawk, a crocodile on the river (YES! There are crocodiles there, so visitors are advised NOT to swim there. Locals, however, swim in certain areas because they believe that crocodiles will only 'take' marked people, and the ones who dabble in dark arts. ), a horn bill. There are oh-so-many-more that I didn't manage to see. If you are interested in birdwatching or observing the wild animals, make sure that you spend a few days around Tanjung Puting. 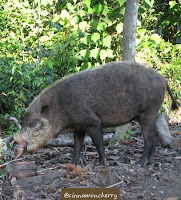 I saw some interesting flora and fauna while in Tanjung Puting. For a city gal like yours truly, they were enough to make me gape for a long time (thankfully I also managed to take some pics). This is the baby monitor. It looks like a crocodile, doesn't it? The guide said it was a baby monitor, so I believed him. The monitors can grow about one meter long, sometimes more. 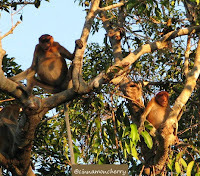 Proboscis monkeys (bekantan)! Ha! Indonesians probably are familiar with them, from the show in Dufan (Dunia Fantasi). They live in groups and they move around a lot, so it's quite hard to guess approximately how many of them still exist in the wilderness.They have long tails for balance and they have very big noses. Each group has a king, usually the biggest male with... yeah, biggest nose. 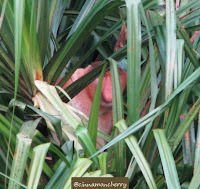 You can see the king here, hiding amidst the wild pandanus plant. They eat the young, tender leaves. I was curious about the taste. One guide, Mr. Yusup, took the proboscis monkeys' food for me. He warned me that it tasted bitter. He cleaned the young leaves and handed some to me. I smelled it, and to me, it smelled wonderful! 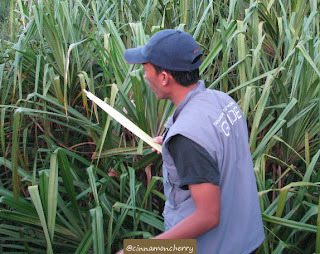 Faintly like the pandan humans usually use to cook, yet it smelled like some kind of vegetable too, probably cabbage. I didn't think it was bitter. It was lovely. My partner, Isman, and Bowo (TravelJunkieID) tasted it too and they seemed to like it as well. 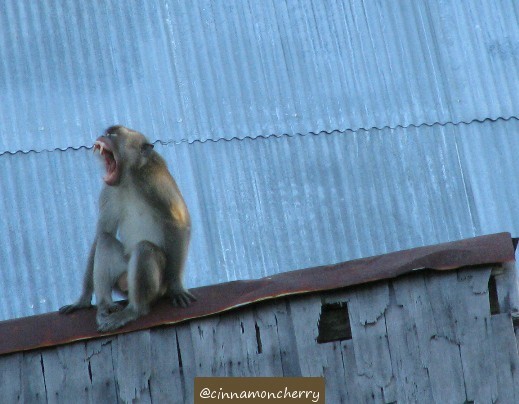 Mr. Yusup joked that we should stop eating or the proboscis monkeys wouldn't be able to eat! Ever wondered why their bellies are so big? Are they voracious eaters? Blame their diets. Proboscis monkeys eat a lot of leaves. Since leaves are difficult to digest, they have two spaces in their bellies to aid their digestion. Proboscis monkeys can swim very well and they can dive gracefully in the river. They sometimes croak "Aow! Aow!" 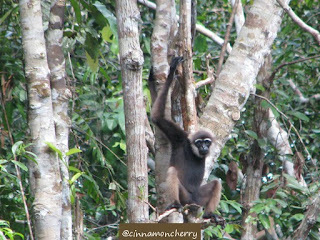 Long tailed monkeys (Macaca fascicularis) are quite abundant in Tanjung Puting. This was the first that we saw. They can adapt to their surroundings very well. They live in groups with one dominant male leading the pack. Mr. Yusup told us not to stare at their eyes, no matter how appealing they are, because to them, it's a sign of aggression. As you can see here, they have sharp teeth and they can be fierce. Since they travel and usually attack in groups, even proboscis monkeys (who are bigger!) are wary of them and avoid them whenever possible. Orangutans. 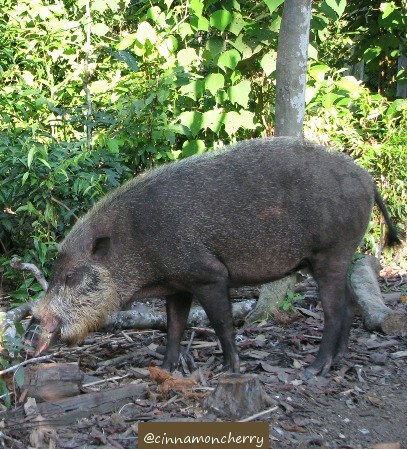 I just realized that the species in Kalimantan are different compared to the ones in Sumatra. Sumatran orangutans have longer and lusher beards. Orangutans can live up to 50 years old. Twins are rare, but an orangutan gave birth to twins once, in Tanjung Puting, even though one died. 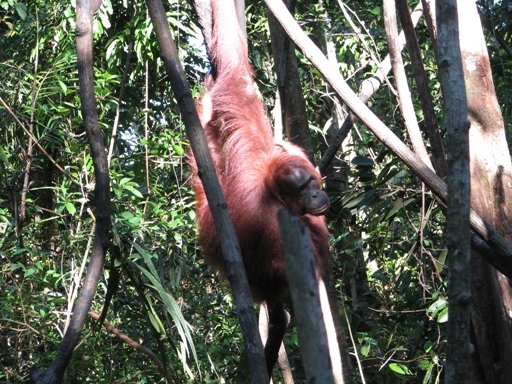 Orangutans have kings that dominate a relatively small area. Male orangutans develop their cheekpads by fighting and being aggressive to other males. Whenever they win a fight, their cheekpads grow bigger. It is a sign or virility and strength. When a former king is defeated, he has to move from the area. He can be beaten to death by the new king should he decide to stay. This one is cute! This three-colored squirrel is trying to nab a banana before the orangutans came. He somehow managed to bring the whole banana to a tree. The tail is impressive! 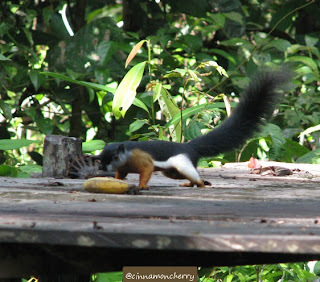 In the three feeding sites for orangutan that we visited, squirrels were abundant. They seek leftovers and if they are lucky, they can steal a banana or two. Bearded pigs. They look scary but the ones that we saw seemed tame enough. 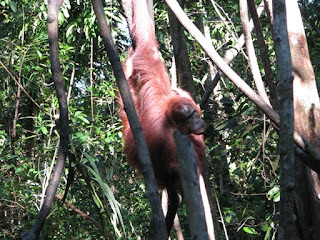 They ate leftovers and rotten vegetables thus becoming quite familiar with orangutans and humans. During the day, they prefer to immerse themselves in the shallow waters to cool their bodies. 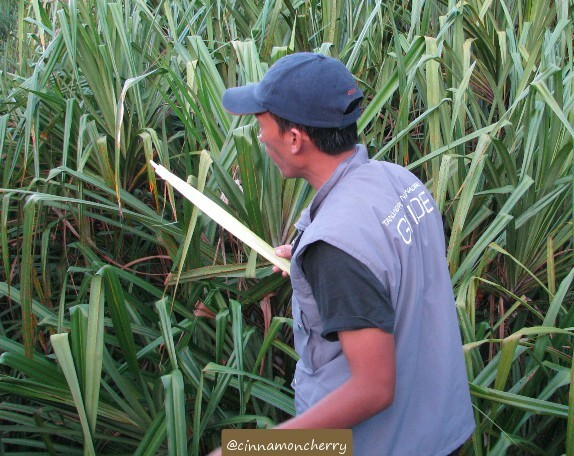 It is said that some Dayak tribes still hunt them for food. Owa-owas. This one was waiting for us at Camp Leakey. Apparently he was quite familiar with humans. He has been accustomed to beg for food, and sometimes he manages to steal some food! IIRC during our stay he managed to take a fried banana. Naughty owa-owa!